SEATTLE — Bartell Drugs is celebrating the holiday season in a big way with the Oh, What Fun! Holiday Event. To add to the excitement of the in-store shopping experience, on December 8th , customers are invited to join in festive activities at each of Bartell’s 66 neighborhood locations. All locations will offer one of the following six activities throughout the day and customers can enjoy all of the events for free. There are activities for kids and adults alike at the Oh, What Fun! Holiday Event. Many locations will host an activity station where kids can enjoy coloring holiday pictures and embrace their own holiday shopping experience. These pictures could be great gifts to frame and give to family members. Also, Santa Claus is coming to town and customers are invited to visit both Greenwood and Sammamish locations for family photo opportunities. Photos are available for free. At other locations, kids can put pen to paper and tell Santa their wishes for what’s under the tree on Christmas morning. Bartells will make sure that the letters get delivered to the North Pole in time for the big day. As for adults, there are fun and helpful events at some neighborhood locations. Those who don’t have time to wrap gifts are welcome to bring up to two gifts to select stores. A team of professionals will wrap the gifts beautifully at no charge. At other neighborhood Bartells, customers are welcome to join sampling parties featuring local holiday chocolates like Seattle Chocolates, Joe Chocolates and Dilettante Chocolates or additional samplings such as SodaStream, Pacifica Cosmetics and Himalayan Pet Supply. Pets are also part of the family and can enjoy holiday fun with a visit to the pet photo booth at both Green Lake and Queen Anne Bartells. WagBooth will be on location providing holiday props and printing photos for free. “We’re so excited to spread holiday happiness in the local community. This chainwide event has something for everyone in the family and we can’t wait to see everyone stop by,” said Kelsey Paige, social media and events manager for Bartells. 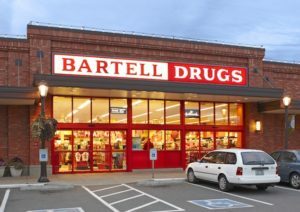 A list of all locations and events can be found at www.bartelldrugs.com/events.